Julia Gronholz has had to scratch and claw for everything she’s gotten so far this season. And it was her grit and determination that sparked Chanhassen’s 4-3 victory over New Prague inside the Eastern Carver County Recreation Athletic Center on Tuesday. The junior’s two-out home run in the bottom of the sixth inning sparked a three-run rally and thwarted a late-charging New Prague squad that scored twice in the top of the inning to take a 2-1 lead. Gronholz’s success against the Trojans could be traced back to the first inning when she battled former summer league teammate Mia Kraimer and drew an eight-pitch walk. “I struggled a bit the game before. To come in with a good at-bat gave me a little confidence,” Gronholz said. 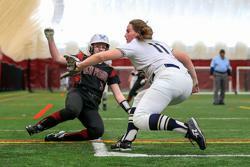 In a season-opening 10-1 victory at Buffalo, Gronholz drove in a run, but it came when she was hit by a pitch. She was 0-for-3 in her other at-bats and said she felt uncomfortable at the plate. Gronholz appeared to have a home run in her second at-bat Tuesday, but her monstrous fourth-inning shot hit the dome roof deep in left field. Umpires discussed the play and called it a foul ball. Storm coach Joe Coenen said it should have been a home run and made a note to himself to clarify with officials before any other dome games that balls that hit the roof beyond a certain distance should be declared a home run. “That ball would have been a home run on any field,” he said. Gronholz returned to the plate and saw two more pitches before doubling to right. But the Storm (2-0, 0-0) failed to score. 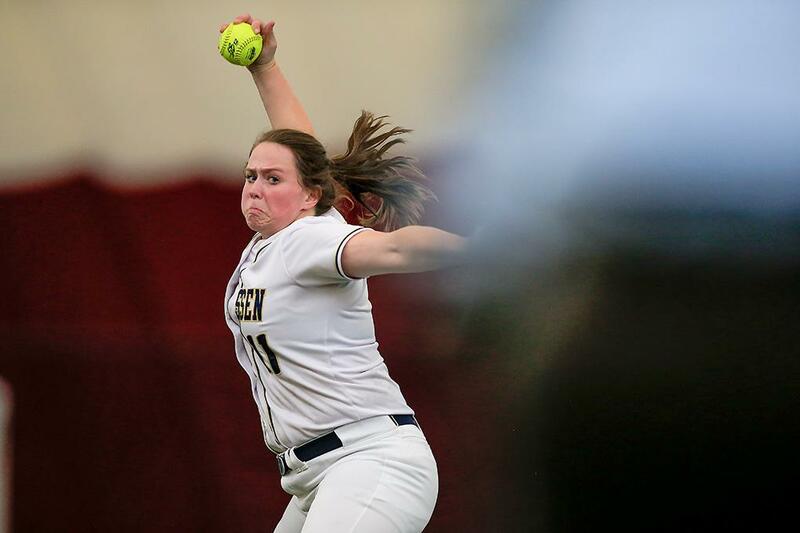 Chanhassen hit the ball hard throughout but had trouble getting much going against New Prague’s Kraimer, a senior who will pitch for the University of South Dakota next year. Kraimer struck out three and walked just one, and her offspeed pitches kept Chanhassen at bay until the sixth. After Gronholz’s home run, Kenzie Miller, Daisy Lang, Piper Krych and Mary Maus strung together consecutive hits to add two more runs. Kraimer finally ended the threat when she got Tollefsen to fly out to right. Coenen praised Gronholz for her determination. The Storm’s rally made a winner out of freshman pitcher Sydney Schwartz, who struck out eight and walked three. 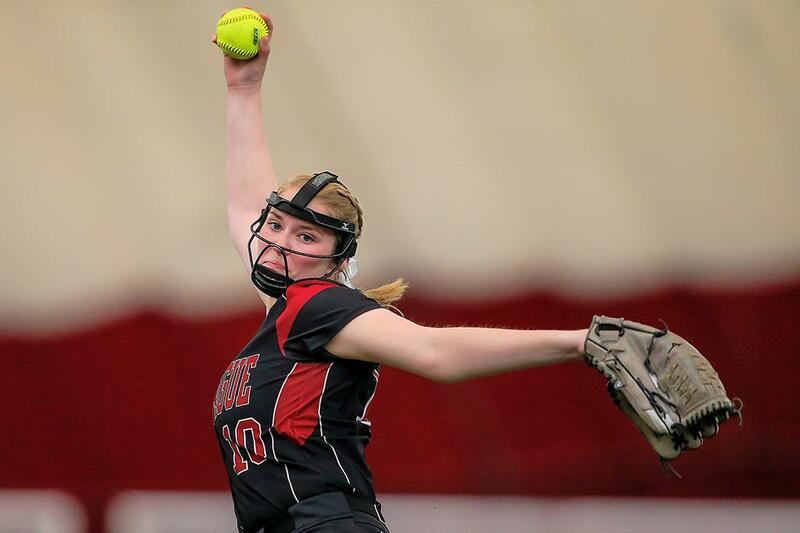 She has collected 21 strikeouts and allowed just two earned runs in 14 innings. Schwartz surrendered singles to shortstop Kennedy Buckman and third baseman Maggie Vivant but got designated player Avery Marsh to fly out to center field to end the game. Kraimer had three hits, including a double, in four at-bats. Buckman went 2-for-4 and Vivant went 1-for-2 with a pair of walks for the Trojans (1-1, 0-0). Julia Gronholz sparked a sixth-inning rally with a two-out home run and Chanhassen escaped with a 4-3 home victory over New Prague on Tuesday. New Prague struggled against Chanhassen starter Sydney Schwartz until the sixth inning, when the Trojans (1-1, 0-0) scored twice after getting a leadoff single by Mia Kraimer, a couple of walks, a passed ball, and an infield error, to take a 2-1 lead. 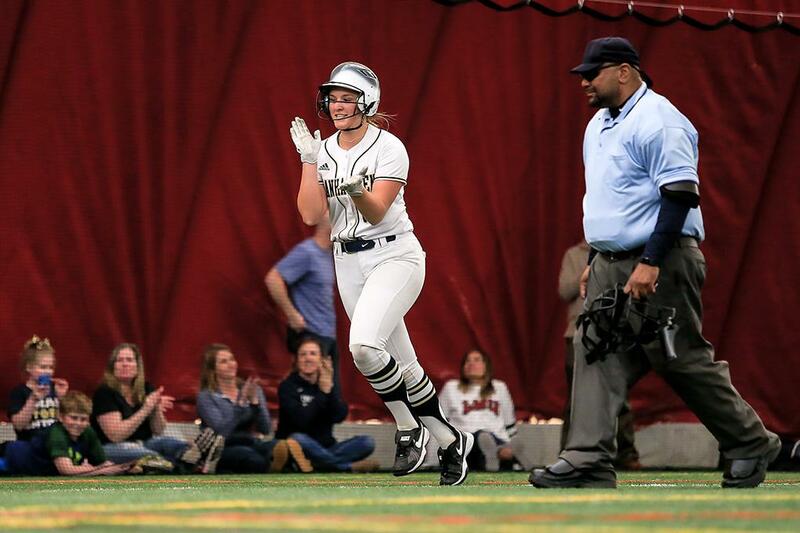 Gronholz, who had a potential home run nullified in the fourth inning when her ball hit the roof of the dome, tied the game with a blast to right field with two outs in the sixth. Chanhassen’s Kenzie Miller singled and went to second on an error, and Daisy Lang doubled to right to score Miller as the Storm reclaimed a 3-2 lead. Singles by Piper Krych and Mary Maus plated a third run and Chanhassen (2-0, 0-0) took a 4-2 lead into the seventh. Singles by Kennedy Buckman and Maggie Vivant pulled New Prague within a run in the top of the seventh but Schwartz got Avery Marsh to fly out to center field to end the game. Schwartz pitched a complete game, striking out eight while giving up eight hits, three walks and two earned runs. Kraimer stuck out two and surrendered nine hits for the Trojans. She was 3-for-4 with a double at the plate.